When it comes to being adorable, you’ve still got it! 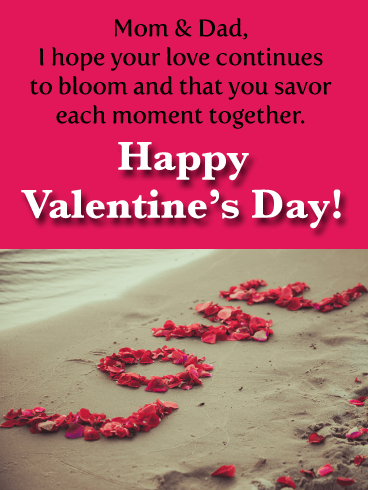 The word “love” is created from beautiful flowers, and placed along the beach, to remind your parents that their love will continue to bloom forever. 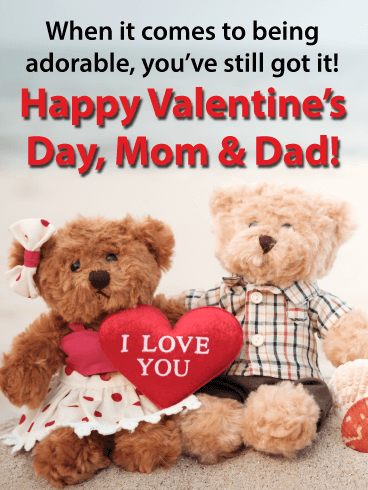 This heartfelt Valentine’s Day card to your mom and dad is a wonderful opportunity to help them savor this romantic day and enjoy each and every moment together. 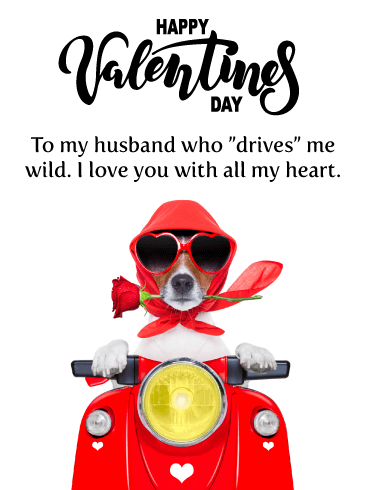 Your parents are sure to feel the love when they receive this romantic Valentine’s Day card. A single heart sits between two forks, ready to indulge in something sweet. In the background, two glasses of champagne are ready to raise a toast, while two beautifully wrapped gifts will soon reveal two special surprises. No matter how near or far you are this year, the unconditional love you’ve learned from them is something you’ll take with you always. 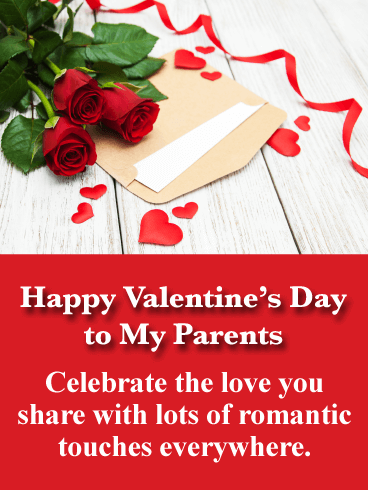 A background of radiant red roses strikes a romantic tone on this Valentine’s Day card for two very special people: your mom and dad. 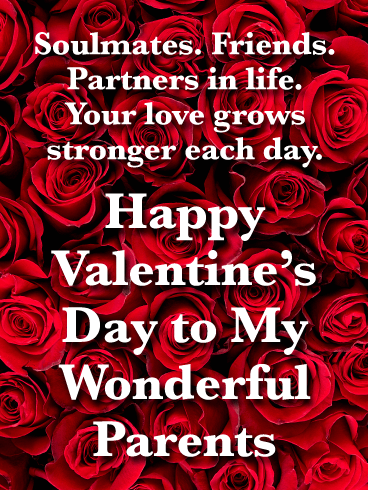 It’s an opportunity to celebrate their relationship, and how much they mean to one another while letting them know how wonderful you think they are. 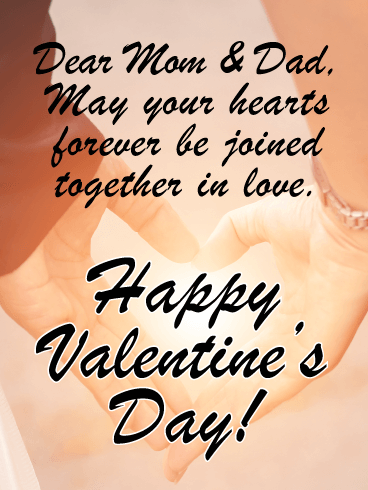 Two hearts, side by side, and a red ribbon curled in front, is symbolic of the bond of love your parents share. What better way to wish them both a happy Valentine’s Day! 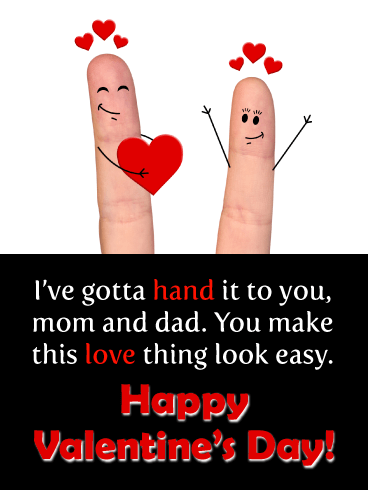 This beautiful card lets your mom and dad know that the feelings they have for one another have always been an inspiration to you, which is a sentiment sure to make them both feel very special. 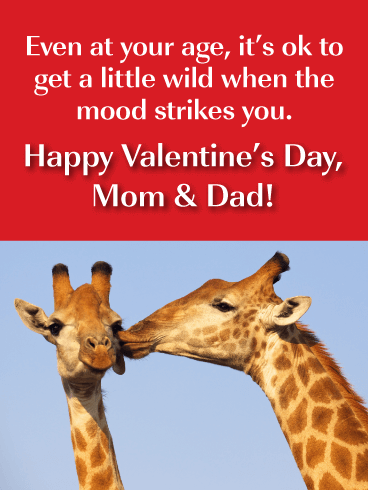 No matter how long they’ve been together, Valentine’s Day is the perfect time to remind your parents that they should always keep the romance alive. 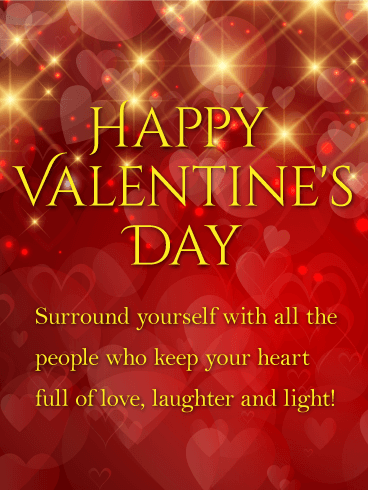 This card is a wonderful start, with classic red roses, hearts and a love note. 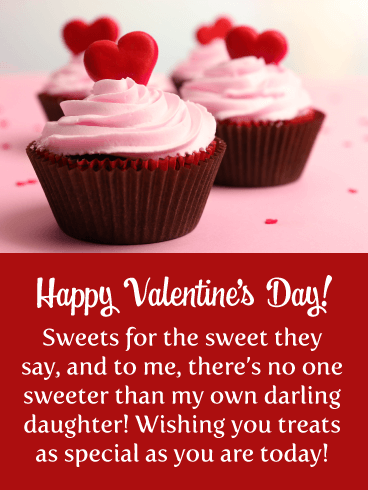 For two people as special as they are, it’s the kind of greeting that will show you care while wishing them a day full of sweet surprises. 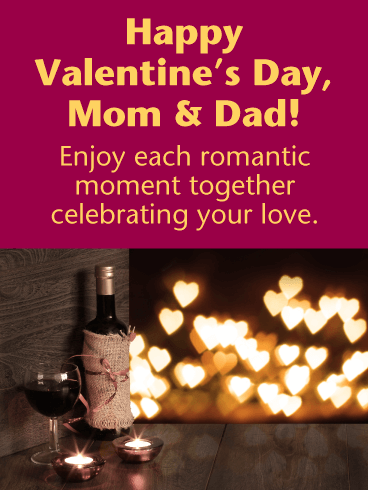 A bottle of wine, two glasses and a beautifully lit background of hearts all set the perfect scene for this romantic Valentine’s Day card to your mom and dad. 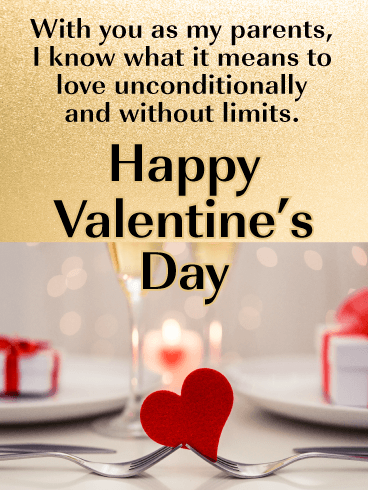 It’s a chance to let them know that this day is one they should savor, enjoying every moment as they celebrate their amazing love and life together. Their hearts will forever be joined together. 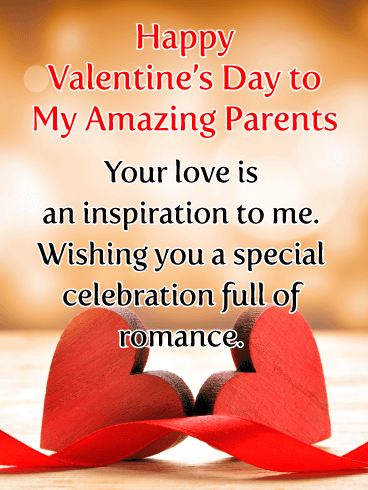 That’s the romantic message on this Valentine’s Day card to your parents, which is sure to make them feel special. Two hands come together, creating a heart, to shine a light on two people who are a wonderful example of what it means to love endlessly and always. What a beautiful way to help them celebrate.